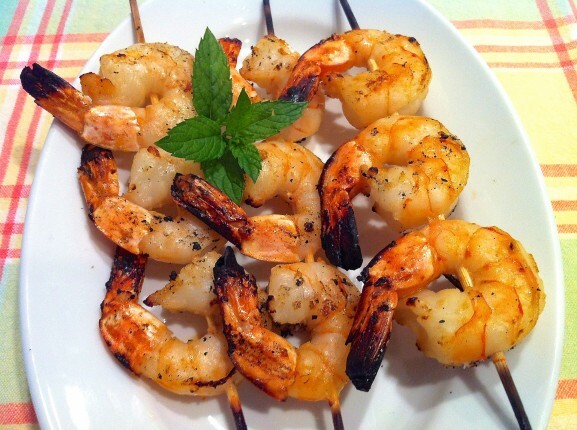 At a cookout years ago, my friend Judy dished up grilled shrimp that was absolutely delicious: light tasting and tender with just a hint of sweetness. I jotted down the recipe, which was mayonnaise-based with an Asian twist, and made a similar version frequently over the years, always served to smiling faces. In recent years, I began working in Greek yogurt for a portion of the mayo. Recently, I decided to try the recipe with all Greek yogurt. Guess what? Not a person noticed a difference! Because I do think a little mayo enhances the flavor, I use the 50-50 combination in the recipe below. Feel free to use all mayonnaise, all yogurt, or something in the middle. Whichever way, the marinade helps to tenderize the shrimp and the flavors are subtle yet delicious. While apricot preserves are in keeping with the Asian theme to this marinade, I often use my homemade peach jam. Use whichever you prefer or have on hand. If you’d like more ginger flavor and a quick side, try pairing these kabobs with Honey Ginger Tomato Salad. Or serve them as a special hors d’oeuvre when entertaining. Between the great taste and the easy, advance prep–not to mention the quick cooking time–this is a recipe I return to often. If using wooden skewers, soak for 20-30 minutes prior to assembling the kabobs. A 2-pound bag of frozen jumbo shrimp that has already been peeled and deveined with the tail left on is perfect for this recipe. In a medium bowl, combine all ingredients except for the shrimp. Place shrimp in a large zipper-top bag. Add the marinade and fully distribute. Place in the refrigerator and allow the shrimp to marinate for several hours. I like to let it marinate all afternoon if possible, but have done it for as short as an hour. The longer it sits, the more the flavor will develop. When ready to grill, thread the shrimp on the skewers. To anchor the shrimp well, place the skewer through the top and bottom of each shrimp. You may also thread each shrimp on two separate skewers to prevent spinning. Grill over medium heat for about three minutes per side or until shrimp is just pink. These look AMAZING! And I love that you substituted the mayo with Greek yogurt, this is right up my alley! These are beautiful! I too love the sub of greek yogurt in place of yogurt. Thanks for sharing. It was my pleasure, Donna! Thanks so much for the thoughtful comment! Gorgeous! I love using Greek yogurt now too. Thanks so much for sharing them on Manic Monday! Thank you very much, Carrie! I am honored to be featured alongside those other delicious-looking recipes!